En Avril 2011 plages Providenciales voté numéro un dans le monde !!! Nous sommes situés à quelques minutes des plages de Grace Bay. Nos caractéristiques de chalets voûtée poutres en bois au plafond et les planchers de tuiles. Il dispose d'un concept ouvert avec un lit queen, table de nuit, un placard et une commode. La salle de séjour a un siège de la chaise et l'amour de la télévision par câble et Wi-Fi. La cuisine a une cuisinière et un réfrigérateur avec congélateur. La cuisine est fourni avec un micro-ondes, grille-pain, cafetière, bouilloire, pots et casseroles, couverts, plats, tasses et verres. Le chalet est équipé avec A / C et de paddle fans. La buanderie attenante comprend une laveuse et sécheuse, fer et planche à repasser pour votre commodité. Salle de bains est équipée de toilettes, douche et lavabo. Il y a un barbecue au propane pour votre usage à l'extérieur du chalet. Détendez-vous autour de la piscine avec une chute d'eau courante ou de prendre un kayak sur le canal. Notre properity est bordée de beaux palmiers, amandier et de fleurs colorées qui fournissent une belle atmosphère sereine. Vous pouvez faire de la plongée et de voir beaucoup de poissons colorés le long de nos plages. Vous avez un accès facile au canal via la rampe de bateau. En plus d'être belle, par nature, nous avons une année température moyenne de 80 degrés F.
Nous sommes situés à seulement 10 minutes des plages de Grace Bay, pêche et le canotage marina et tous les hôtels et restaurants à Providenciales. Le terrain de golf est à 10 minutes de notre emplacement aussi. Nous vous rencontrerons à l'aéroport à votre arrivée ou à l'agence de location de voiture, vous pourrez alors nous suivre jusqu'à la propriété située à quelques minutes de l'aéroport. 6 couchages voir calendrier pour les dates disponibles de la maison principale. En raison du fait qu'il ya une piscine et un canal attaché à cette propriété, nous conseillons aux parents de regarder correctement sur leurs enfants de près et qu'ils acceptent l'entière responsabilité de leurs enfants. Limite d'âge minimum pour les locataires. We loved the Palm Breeze guest house. It was the perfect spot for the two of us to enjoy 9 days in TCI. The guest house is well appointed with all the comforts of home and Miki made sure to check on us regularly. We rented a little car to get around the island and while Cooper Jack Bay Rd is “unpacked”, it was easily accessible and no 4wd was necessary. I will definitely recommend this property and the main house to all my contacts who might be visiting TCI. While you need to drive to the beaches, there are so many options for fun days and great restaurants in paradise. Thank you so much for your review and for being our guest. All the best. We loved the property and all that surrounded it. The cottage was perfect for us and Mikki and Jeano both went above and beyond to make sure we were pleased with our stay. We loved the landscaping around the cottage and the canal and pool areas were more places to relax and enjoy. We would definitely stay here again and would also highly recommend it or the house that was on the property for larger families. On a scale of 1-10, we would both rate this cottage as a 20!!! Thank you so much for your great review and for being our guest. All the best to you and family. Happy New Year. Just spent a week at the cottage. While the property itself is well equipped and maintained the road in is awful and would be best traveled if you have a 4 wheel-drive vehicle. We were always very cautious coming and going in our economy sedan rental and were amazed at the local residents bombing down the road. We enjoyed coffee by the canal every morning while watching the sunrise and again at the end of a long day at the beach. A late afternoon dip in the pool was a great perk. Guests arrived at the main house mid-week and although the pool area is shared between the two houses we felt like we were intruding. WiFi worked just fine. If TV is your thing, due to the hurricane, there is no cable in this area/road yet. Lighting could be better, brighter bulbs in lamps and fans would help. Only lighting in the kitchen area is one strip of under-cabinet lighting. There was a problem with the toilet tank that made the water pump (located in the cottage in an area above the bathroom) go on every 5-10 minutes. Mentioned this to Jeano and a maintenance guy was there within an hour. We were told a part is needed that is not available on island. Owners will bring it when they arrive in May. We used the provided beach chairs, umbrella, and cooler to venture to a different beach every day. Plenty of towels, bath & beach, and a large beach bag to lug our stuff! Great to have a washer/dryer (no detergent provided) to use. Central location made it easy to get to either end of the island. 4 out of 5 stars only due to condition of the road which is no fault of the property itself. Thanks to Patty, Jeano and Miki for all your help and info. Thank you Gail and Derek for being our guest. All the best to you. Cottage was exactly as promised, perfect size for 2 people and the amenities were an added nice touch. Nice table on back porch for dinners outside, with the pool being a great added bonus. We would eat our breakfast down by the water and the kayaks make for a great few hour adventure! The perks of this place were that Miki met us at the car rental and we followed her back to the suite (good way to get used to driving on the left), and she was always extremely quick at responding for any questions we had. The beach umbrella was broken and she brought a new one the very next day for us. Would definitely stay again if every back on the island! Thank you Gareth for being our guest. All the best to you and your family. Great stay for the two of us! 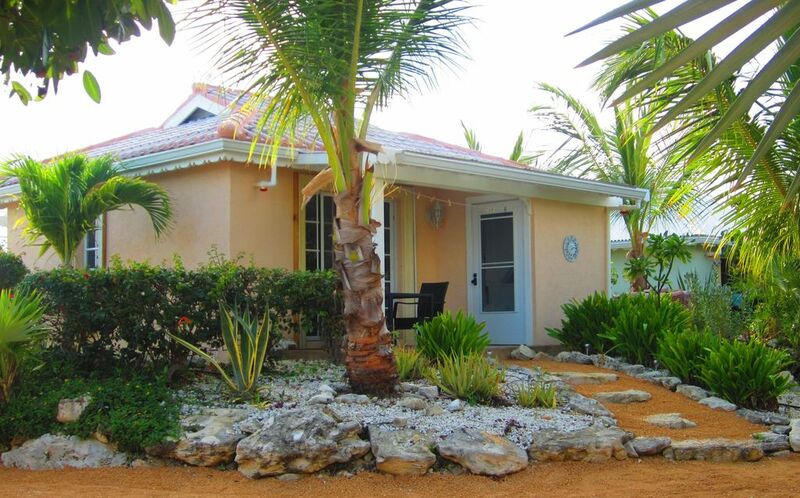 The Palm Breeze Bay Cottage was perfect for our two-week stay on Turks and Caicos. The cottage was well equipped and clean. The pool was wonderful after our daily stays at the beach . . . with a cocktail in hand of course. Would definitely stay here again. And thank you Miki for meeting us at the airport. This was a great place to relax. We were picked up from the airport shown around a bit and taken to the store for supplies. Thanks so much Jeano!! The cottage had everything we needed and had breakfast by the the canal each morning. Would highly recommend a stay here!! Thank you for your kind review and for being our guest. All the best to you. CANCELLATION POLICY IN THE EVENT THAT YOU NEED TO CANCEL YOU WILL RECEIVE A CREDIT WHICH MAY BE USED AT ANY FUTURE AVAILABLE DATES. SORRY NO REFUNDS. CANCELLATIONS MUST BE MADE NO LESS THAN 14 DAYS PRIOR TO ARRIVAL DATE.